The lift truck is the single most dangerous vehicle in the workplace. 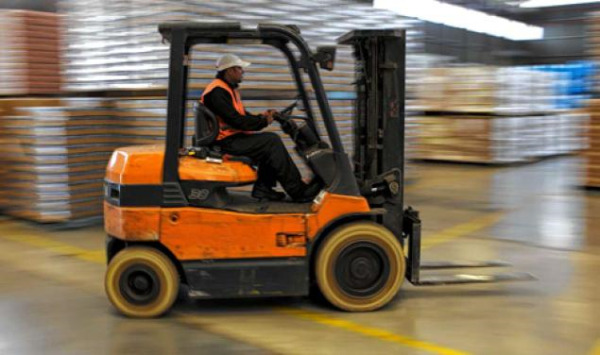 Forklifts alone account for up to 30% of total vehicle related accidents every year. If your equipment is not functioning at its optimum performance, you put your facility at risk of accidents. By having your forklifts in good condition, you reduce downtime, minimise risks of accidents and ensure high performance and profit. However, sometimes it can be more beneficial in the long-term to replace old forklifts than continuing to maintain out of date and worn out models. Recently, a Yamaha Schiphol motorcycle parts distribution centre reported cutting their total costs by 10% and dropping their fleet damage by over 30% simply by replacing their ageing forklift fleet. There are many areas your forklift’s age can cause serious problems. We have outlined a few of these and some solutions to these risk areas. Tyres are the surface that collects the most wear and load from the daily movement of the truck, they absorb all the weight of each load and negotiate its contact with the ground. You should be checking the wear on your tyres regularly as they can be easily damaged. There are two kinds of tyres and they each require different checks for their general condition. Most cushion tyres will come with wear lines set at about 50%, it is recommended you consider replacing the tyres once they exceed this line. You should also examine your tyres for any damage through tearing, chunking or cracking. These instances can happen from debris, misuse or even just standard wear. All of these can result in an imbalance through an uneven tyre surface, decrease in stopping distance through lower traction and a decrease in fuel economy due to poor surface contact. Keeping a clean work environment is obviously the best method of ensuring your cushion tyres last. Pneumatic tyres on lift trucks are largely for outdoor application and thus meet the tougher demands an outside environment places on the tyres. Their signs of wear are also different to cushion tyres. Tread depth should be measured to assess how much general wear the tyre has, the 2-inch rule is normally used to advise on this. But, this measure is not as reliable as the wear lines on cushion tyres, mainly because pneumatic tyres have a wider size variance and are designed with a more rigorous application in mind. Cuts in the tyre, particularly if cords are visible, should be addressed immediately. Finally, unlike cushion tyres, inflation is an issue for pneumatic tyres. If the tyre is overinflated, traction is decreased and this effects the stability of the vehicle. Equally if the tyres are deflated the truck decreases in stability and traction. The best way to mitigate these risks is to ensure a stringent maintenance and checking policy for your lift trucks. The tyres should be checked at the end and beginning of each shift. This creates a double check to ensure that no signs of wear are missed. If a tyre is compromised it should not be driven on and replaced immediately. A forklift battery can be a fire hazard if not checked regularly and replaced at any signs of serious corrosion. Forklift batteries can also become problematic if they are left to severely degenerate in lifespan. A dead battery in the middle of a picking procedure is dangerous and time consuming. Crown forklifts predict that 10% of batteries fail prematurely due to improper charging. If forklift operators know the forklift has a low charge they may push the truck to make it through its shift without having to recharge or swap trucks. That 10% of premature failing also means 10% of your lift trucks will be creating delay through ineffective batteries. This battery ageing with improper care negates to some extent the increased lifespan of electric forklifts over internal combustion types. Forklift batteries have to contend with sulphate build up from the time they are made. Sulphates can greatly reduce the battery’s ability to recharge and through the resistance they provide can greatly diminish its capacity. The sulphates trick the recharging device into thinking the battery has a higher charge than it actually does. You should regularly check your battery for sulphate build up and any other problems. If you don’t want to pay the large fees associated with buying new batteries, consider investing in a battery de-sulfator, as it will greatly lengthen the life of each of your regenerating batteries at a fraction of the cost of buying new ones. By having active speed control with possible augmentation for zone control you can create zoned maximum speeds for the forklift that cannot be exceeded by the operator. This will ensure that the maximum speed of your chosen areas is always adhered to, greatly reducing risk and increasing safety. An effective fleet management system will track each truck and measure its distance travelled, lifting exercised and its battery use. This allows you to keep track of what needs inspecting. Many fleet management systems will do the calculation for you and alert you based on allocated time frames when things need to be inspected. The system can also monitor the lift truck in a way that will pick up on any malfunction when it is turned on so that a malfunctioning truck isn’t ever put into use. While fleet management systems are fantastic for increasing safety they are also great in helping you optimise your fleet. Crown believes their Infolink system can help reduce their customer’s fleet size by 3-5%. Through tracking, managers can check the productivity of each driver and the use of each truck; then using this data they can create the optimal plan to meet each weeks workload. Fleet management systems can also provide warnings when the truck is overloaded or going too fast. 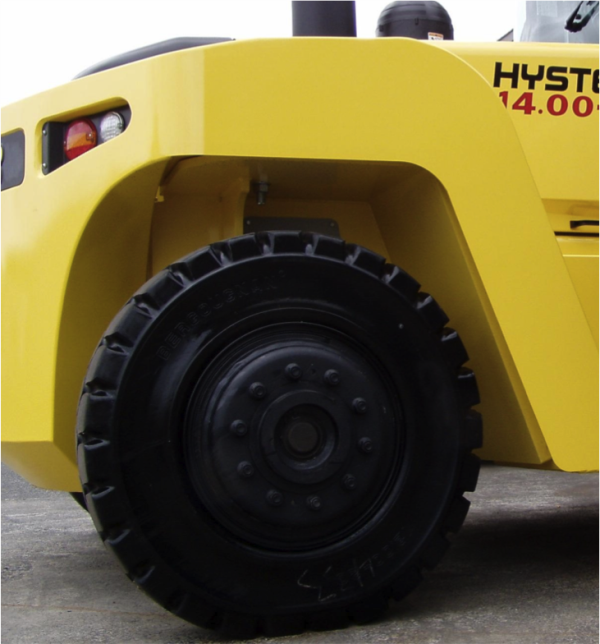 Some systems even have a handbrake interlock system as available in AAL Hyster’s Forktrack system that ensures the handbrake is always engaged when the operator leaves the vehicle. It also shuts the vehicle down, saving energy. The design of the warehouse is also important, think about aisle width and shelf density. Also consider what sort of segmentation you warehouse needs in terms of doors and walls. Your doors should be automatic, fast and robust. Doors provide the only access into and out of your facility and thus your lift trucks interaction with them is a critical part of keeping accident free and ensuring high productivity. Robust doors that can withstand impact without imparting damage on the forklift are ideal. 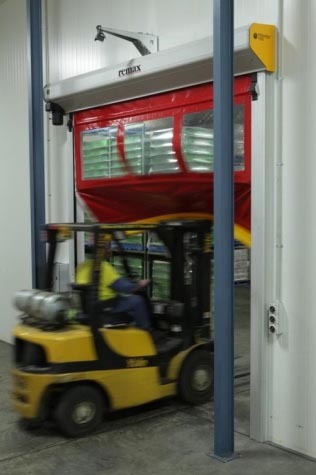 Some high-speed doors are even built with a self-repairing feature to accommodate impact with forklifts and other vehicles. This allows the door to derail and protect both itself and the truck in the process. The age of your forklift is not the only thing to consider. You should also be considering the age and suitability of your facility. The working surface needs to be clean and unbroken; anything that interrupts the regularity of the surface immediately creates a hazard. This can include things beyond cracking and decay; things such as oil or waste lying on the work surface can create serious hazards. 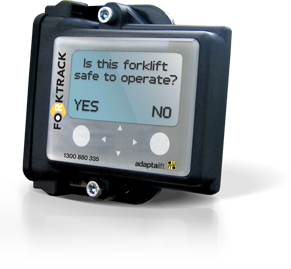 You should attempt to optimise the warehouse environment as well as your forklift fleet. Putting in place practices such as slotting can decrease the wear on your forklifts while increasing productivity and profits. Segregating pedestrian and traffic zones is also essential. The best way to do this is through clear marking and signage combined with the appropriate dispersion of guardrails and bollards to define and protect crucial areas. This will increase the safety of your warehouse for pedestrians and drivers. It also increases the lifespan of your forklifts by decreasing the amount of potentially dangerous impacts with the surroundings. The signs and solutions above should be considered when trying to reduce accidents and increase forklift productivity in your warehouse. The implications of not having rigorous maintenance policies and stringent safety guidelines can be a loss of product, money and even life. If you would like to read more about preventing forklift accidents, you can read last months blog about the major accidents of 2013 and how to prevent them in 2014. Or, you can click on the link below to download our comprehensive free eBook on managing warehouse operations.